A Wonderful Hum of Activity: Choice Time! 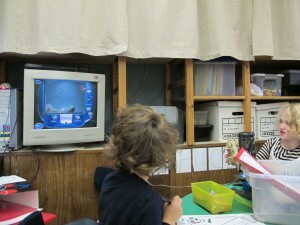 Since I last wrote about Bill’s kindergarten class, I’ve had the opportunity to visit two of his Choice Time periods. Oh, what fun I had! Let me share some of the centers that I observed. 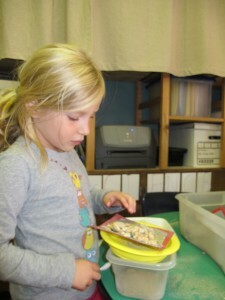 The Science Center –The children pretty much set up the center themselves. 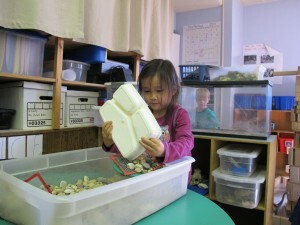 They took a big plastic bin filled with sand, pebbles, rock and shells off a nearby shelf and placed it on the table. They had all different types of sieves, cups and magnifying glasses. But one thing that’s REALLY special is the microscope that’s hooked up to a computer screen! I was so fascinated by the enlargement of materials and the children had some wonderful conversations. One of the girls at the center was practically jumping with excitement.” I never ever went to this center! Look how many pebbles I got (in the sieve). I never knew science was so much fun!” Bill put out paper, pencils and crayons for the children to record their observations. The paper had a drawing of a microscope as part of the border and I noticed that, after a while, the girls became involved with coloring in the picture, taking some of the focus away from their detailed drawings done from observation and I wondered if this would happen if there were colored pencils available but not crayons. It’s just a thought that I had. I’ll see what Bill thinks about this when we have time to talk. The Block Center: This year, when Bill set up his room he devoted much more space to the block center and this has had a noticeable impact on the quality of building being done and on the collaborative work that the children engage in. They spend more days working on structures and each day revise and add to the work done by the previous builders. 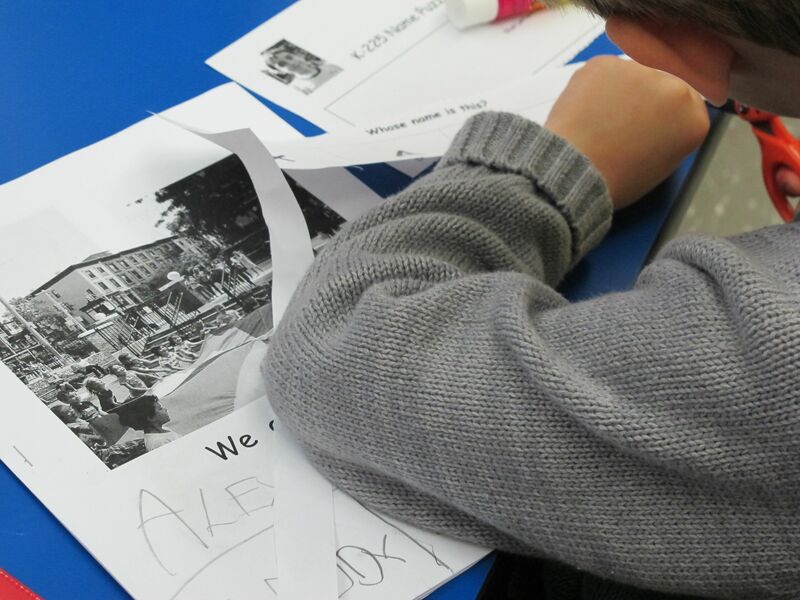 It will be interested to see how the building work starts to reflect the playground trips that they will take as part of their playground study. I think that it might be a good idea for Bill to set up a display of playground books in the center as “inspiration”. 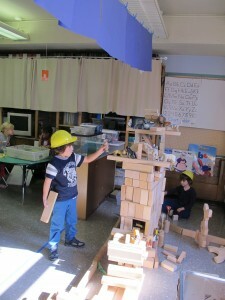 Dramatic Play: Rather than have a traditional “kitchen” set up, Bill stacked hollow blocks against the wall by his meeting area. There’s also a small bookcase that has bins with various ‘props’. The day that I was there, the children first seemed to be building a house. Then one of the boys discovered a sailor hat in the bin and before you could say “presto” the house turned into a boat, a sort-of houseboat! This changeable environment allows the children free reign in setting up scenarios. Having this center located on the rug also frees up more space in the room for other activities and it gives the children a large area for their dramatic play. Star Name – Bill has been doing a name study based on the work of Patricia Cunningham. The Star Name Study Center gives children the opportunity to play around with names and letters. They have class lists with photos of each child, blank books, letters, pencils, marker, and paste. I remember observing this center in Bill’s class some years ago and he added alphabet grids for the children to use along with clipboards. I saw the children using these grids to ‘survey’ the class…How many names from our class go in the ‘A’ box?, etc. The children were not told what to do with the grids. They came up with this survey idea on their own. I wonder if he will add something like this to the center this year? When I was teaching kindergarten, I had mystery name puzzles in little clear plastic zip-up bags at the center. I’ll ask Bill if he thinks his children might find the puzzle idea interesting. Perhaps they could make up their own name puzzles on thin cardboard! 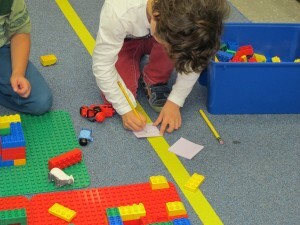 Duplos– I was particularly interested to observe this center. It’s an area where I often experienced difficulties. I found that children used the materials to make weapons and that they had a tendency get out of control. Many of the teachers who I work with face the same problem with Duplos and Legos. On the day of my visit, it was all boys at this center (3). They seemed to be totally engrossed in their constructions. It was parallel play but they were conversing with each other. After a few minutes, one child realized that he wanted a ‘door’ that was part of the other’s construction and it looked like there might be an explosion! However, he stopped arguing and came up with the idea of building a door. This was so interesting to see. I think that as teachers, we sometimes tend to jump in to mediate before giving children time to work things out on their own. I asked the boys if they would like some sticky notes to write signs for their building and this idea took off for a few minutes. About midway through the center time, the boys lost interest in their constructions and began throwing the Duplos at each other and around the carpet. Bill had to stop in to calm down the situation. I don’t think it was unusual for this to happen with these particular materials at this time in the school year. I’ve found that if this construction is done on a table, rather than on the floor, the children stay more focused for longer periods of time. Also, it’s helpful to give them a large cardboard to work on and encourage them to come up with an idea for working together. (i.e. a space station; a playground; a city, etc.) They can have other materials to supplement their construction such a sticky notes, crayons or markets for writing on the cardboard, little figurines and even some books as ‘reference’. Doing this will often encourage more collaborative and inventive play. If it’s on a cardboard, it can be brought to the share meeting after Choice Time, a sort-of mini- celebration. Easel: When I was there last week, there were two children working at the easel. Only black and white paint were out. I wondered about limiting the colors at first, but it actually was quite fascinating to see what the children did with only these two colors. There was a lot of mixing, forming all different grades of grays. Bill had a sponge available at the easel for cleaning the brushes, but Sophie chose to use it for creating all kinds of textures on the paper! The limitation of having only the black and white seemed to open up more experimentation. I can’t wait to speak with Bill to find out if that was his purpose or if the experimentation was a surprise. Art Center: This was quite interesting because I noticed a different quality of work each week. I’m not sure if it reflected the children who were there or the choice of materials. Let me explain a bit. 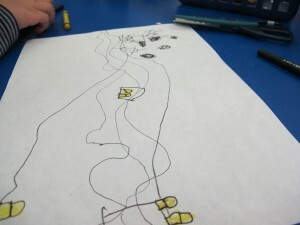 During my first Choice Time visit, one boy was intensely working on a “Pirate Map.” He told me that he always plays pirate games and he loves pirates. As he was drawing, he talked his way through the process (“Here’s where he starts. Then he has to go around the island. This is the first treasure. Let me get a yellow crayon for the treasure. Okay. Here’s the second treasure. That’s the big treasure.” He literally spent the entire period working on his map. At the same table a girl was twisting and gluing paper to make an intricate pop-up picture. She proudly brought it over for me to see. I wondered if she could make a pop-up playground. She wasn’t sure if that would be possible but she thought that she could try it next time. I’m not sure if she followed up on that. I think it could be a brought up at meeting time as a challenging activity that children might want to try. Perhaps she could give a demonstration on how to make a pop-up picture and help out at the center if children seemed interested. When I returned to obseve this center on my second class visit, the children were tracing, using cardboard shapes and cutouts. The work at the table seemed, to me, significantly less personal and creative. 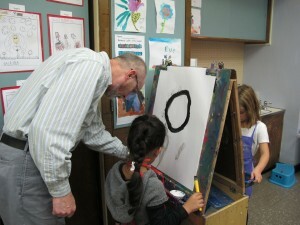 Children were limiting themselves to tracing the shapes and coloring them in. The creative and individual use of materials that I saw on my previous visit was not in evidence on this day. Cooking: Bill, like many teachers today, is alone in the room with 24 children. This makes doing activities like cooking or woodworking a real challenge. On this particular day, a mother came in to make gingerbread cookies with the children. She made the dough ahead of time and brought it to school with flour, rollers, and cookie cutters and with all sorts of goodies for decorating the cookies. The children were quite excited and involved with this activity. They were making enough cookies to share with the class. I spoke with Bill about how I believe that the process is even more important than the final product. I suggested that if he could get one parent a day to help out (he thought that he could do that), then he could make something that is worked on all week. For example, I remember making a carrot cake with my class. On the first day the children washed and scraped the carrots. On the second day the children at the center grated the carrots. 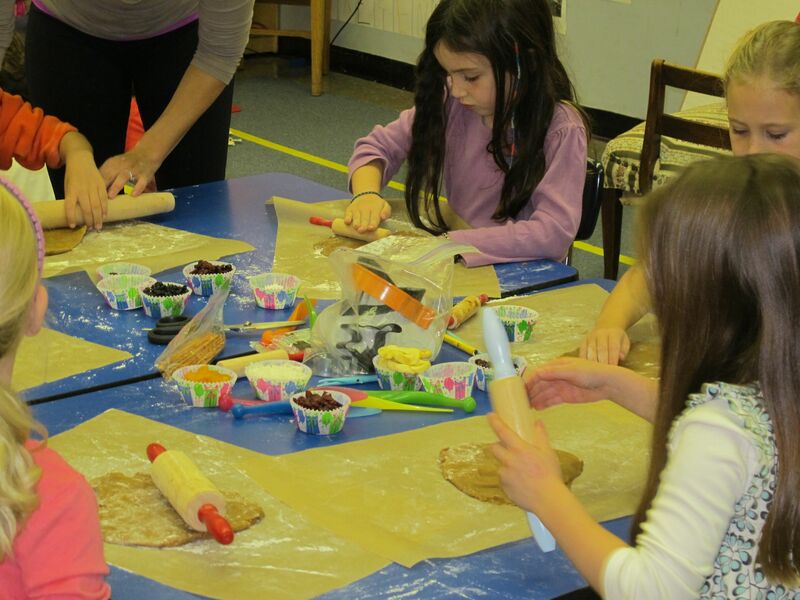 On the third day the next group began making the dough. The dough was completed on the fourth day and baked. On Friday, children cut and served the cake during Choice Time, made individual booklets about carrot cake, washed all of the utensils, took a survey of who did and did not like carrot cake. It was a class effort. There are many different recipes that can be broken up this way. When I shared my thoughts about the cooking center with Bill, he excitedly came up with the idea of spending a week making an apple pie. Bill took my suggestion and ran with it! It’s so wonderful that, even though he’s been in the classroom for quite a few years, he’s still open to suggestions and to growing professionally. We haven’t spoken yet, so I don’t know if the apple pie happened yet. I’ll update you on this after Bill and I meet. The Light Box Center: This is an area where Bill and I have different opinions. In his class, the light box is used for tracing pictures, the kind of dinosaur or animal pictures that come from commercial coloring books. The child picks a picture, tapes it to the surface of the box, puts tracing paper over the image and traces along the lines. Then afterwards, many of the children color their traced picture just as they would color in a picutre in a coloring book. I see the box as an opportunity for children to experiment with color, design, shadow, and translucency. When I visited a school in Reggio Emilia, I saw children using natural materials that seemed to come from the park near the school, moving them into designs on the box and watching how the designs changed as they leaves and pine cones were reconfigured. At a kindergarten class in a school in Brooklyn, I observed children cutting out shapes from different colored tissue paper, layering the paper on the light box and getting excited as they manipulated the papers to change the colors. 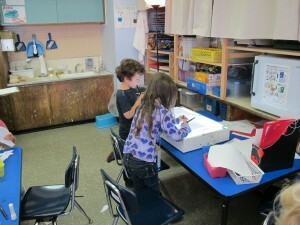 The two children at this center most definitely were very involved and focused on their tracing. I asked one of the children what she liked about this choice center. She said that she liked it because she didn’t have to think about anything. She just did it. When she said this, Max, who was working with her, shook his head in agreement. I shared this child’s comment with Bill later on. I found the lack of thinking disturbing. Bill, however, had a very different take on this. He suggested to me that I consider how the mind is resting while the body is learning a new skill. I’m curious to hear what other educators think of this. This could prove to be an interesting discussion. What I totally love about working with Bill is that, even if we disagree on something, I know that everything he does in his class is well thought out and purposeful. He is always considering what is best for the children. Bill understands that children are making important scientific and mathematical connections as they pour, separate and observe the sand and pebbles in the science center. They’re learning about balance, shapes, and measurement as they construct with unit blocks. The children who are making Star Name books are working with letters and sounds. 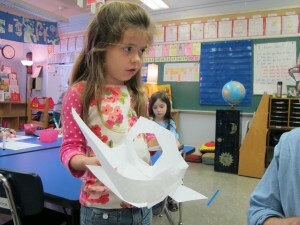 At all of these activities, they are practicing collaboration and sharing. Bill has also created a marvelous feeling of harmony and community in the room. 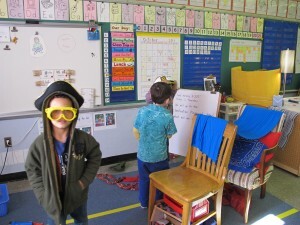 Clean up time, so often a teacher’s nightmare, was so interesting to observe because, without being told, children offered to help each other get their centers put away – no fuss, no tantrums, no mess! As I stood to the side, watching the children at their centers, I pulled Bill aside and asked him to enjoy with me the wonderful hum of activity in this room! This entry was posted in Investigating Choice Time: Inquiry, Exploration, and Play and tagged Duplos, hollow blocks, Legos, light box, name study, Patricia Cunningham, science, sifter, star name, sticky notes, tracing, translucency on November 5, 2011 by Renee.